This set of three small gravestones leads us into the story of this family and their lives. The stones are situated on the exterior of the south wall of the chancel, which is an extension constructed by Hay and Henderson in 1892. Thus, these three gravestones must have been moved from their original positions to their present site. Before considering the lives of the three people who were buried in St Mark’s graveyard it may be helpful to learn about the life of the one person who was related to all three. Although he was not actually buried at St Marks, the incumbent John Boyle is named on two of the three gravestones and is very much involved in the family’s comings, goings and, what we would now call life events. A search of ‘Ancestry’ records that John Boyle was baptised on 20th October 1799 in Blackley, Lancashire and that his father was William Boyle, although the 1861 Census records that John Boyle was born in Hull. The All Saints Parish Church, Narborough (Biographies, Leicestershire Villages) tells us that John Boyle of Summergangs, Hull was admitted as a pensioner (probably meaning a student receiving financial support) at Trinity Hall, Cambridge, 4th July 1826. He matriculated for Michaelmas. It was by no means unusual for clergy in the Scottish Episcopal Church to be educated in England before embarking on their ministry in Scotland. He must have been a very able student as John Boyle was awarded two College Prizes for English. His career development is shown in Table 1., although the gap between 1832 and 1840 is, as yet, undocumented. His list of publications (Table 2.) is helpful, though. The introduction/preface to his 1836 publication is signed off from ‘Barton vicarage’. While there is a Great Barton in Suffolk, Barton-upon-Humber is more like his ‘patch’; the website for this village, though, only provides information as far back as 1885. According to the first Scottish census in 1851 the Rev. John Boyle was then living alone in Hamilton Lodge, Easter Duddingston, and had one domestic servant. His move to Holy Trinity Barnstaple, Devon in 1858-62 was also mentioned in the Bucks Herald of 4 September 1858 under “Perpetual Curacies”. We have been unable to find his death in ScotlandsPeople, but the death of John Boyle LLB was recorded in the Exeter and Plymouth Gazette. This newspaper noted that the Reverend John Boyle LLB had died at his residence, Baltimore Villa, Leamington on 14 July 1866 ‘in his 67th Year.’ A search of ‘Ancestry’ informed us that his death, or rather his burial, was on 19 July in the parish of Leamington Priors, All Saints, Warwickshire, where he was a freehold tenant. As is clear from Table 1., John Boyle’s career appears to have involved many moves for him and his families. It is not certain whether this was usual for those in holy orders at that time and, if it was, what the rationale was for such enforced mobility. ‘John Boyle’ is such a common name that it makes him difficult to trace, and the English records are much more tricky to use because the population was so much larger and there are not many death certificates online. Fortunately, though, John Boyle was sufficiently proud of his degree to use his letters ‘LLB’ quite consistently. Thus, his pride was helpful in facilitating our search. John Boyle, aged 23, married Harriet Huntington, aged 24, on 18th June 1822 in York. It is interesting that both were young and that, unusually, Harriet was one year older than John. She had been born Harriet Huntington in Yorkshire in 1798. Ancestry’s English Census record for 1841, records Harriet Boyle, aged 42 as living in Elloughton, Yorkshire. Living with her in 1841 were Charles H. Boyle (aged 18) and John Thomas Boyle (aged 13). Her husband must have been away somewhere on that day. It is not known whether the couple had more children or how many survived. The Rev. John Boyle LLB, incumbent of Portobello, performed the marriage of the Reverend John Thomas Boyle, chaplain to the Right Reverend Lord Bishop of Glasgow and Galloway to Sophia, youngest daughter of the late John James Esq of Glasgow. According to Ancestry John Thomas and Sophia had a son, William Vere Huntington Boyle, who died in infancy, but the date is not known. John Thomas Boyle was the incumbent of St Saviour’s Episcopal Church, Logie in Perthshire when he died on 3 September 1879 in the Parsonage, Bridge of Allan. He was aged 51 and died from an inflammation of the brain. By this date John Boyle, his father, had also died. “In memory of Eliza, the second wife of the Rev. John Boyle LLB, incumbent of this church. She died to his inexpressible grief, deservedly lamented by her family and friends 28 February 1854 aged 44 years, and her remains with those of her only child are deposited in the grave below, it is confidently believed, in sure and certain hope of a glorious resurrection”. John Boyle was the incumbent at St Marks for twelve years from 1842. He was a widower aged 51 when he married Eliza Reynell, a spinster residing at Appleby in the County of Westmoreland having been born in Kendal. Eliza was aged 41 with a domestic servant, and is described as being ‘a landed proprietor’ and he was ten years older. 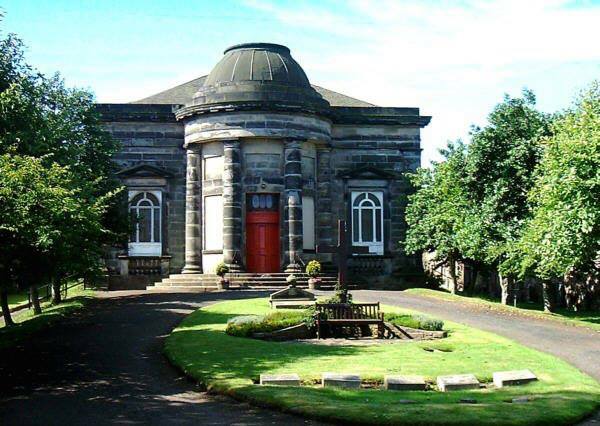 The wedding was on 10 July 1851 after the banns had been publicly read out in Duddingston parish church on 29 June that year (FR2171). Despite what we might consider to be her advancing years, she must have conceived quite quickly because their son George Henry Reynell was born less than one year later on 15th June 1852. This gravestone’s special interest lies in the eschewing of formal reporting of the facts of Eliza’s death to reveal the heartrending sorrow which her death aroused. These agonisingly poignant words are in sharp contrast to the more factual engraving on the gravestone for Harriet, John Boyle’s first wife and mother to (at least) two children with him. It is difficult to know whether such different expressions of grief reflect the different relationship which John enjoyed with his second wife or whether the events of the four years between the two deaths made him more determined to share his sorrow, perhaps hoping to make it less unbearable. “of her only child are deposited in the grave below”. That Eliza died in childbed when George was born is not possible because his gravestone reports that he died in 1852, at only four days old, which was almost two years before she died. It may be necessary to consider, though, other possibilities such as that she may have become pregnant again and died during this second pregnancy. This is unlikely, though, not only due to her advancing years but also because of the reference on her gravestone to “her only child”, presumably George. According to Ancestry Eliza’s death was mentioned in The Gentleman’s Magazine, which was rather like an English equivalent of the somewhat eclectic The Scots Magazine. “In memory of George Henry Reynell Boyle, born June 15th died June 19th 1852. Of such is the Kingdom of Heaven”. What was the cause of his death? Did he succumb to an infection, was he born too premature to be able to survive independently or did he have some physical anomaly which was incompatible with life? Because he was born into a family of the middling class, as were most members of the Scottish Episcopal church, his birth might have been attended by a medical practitioner; so the birth might have been assisted with instruments, such as forceps, which would have been facilitated by the use of the increasingly-fashionable chloroform. Such instruments might have caused trauma to his intracranial structures and prevented him from feeding effectively and thriving. The death of baby George is recorded on his gravestone together with a quotation taken from Matthew 19:14 which Jesus said after admonishing his disciples, saying ‘Let the little children come unto Me’. This quotation was intended to help grieving parents to come to terms with the death of their child by reminding them that she or he was being welcomed by Jesus into heaven. These three gravestones are of a matching design. The only exception to this observation is that George’s gravestone has an anchor, a Christian symbol of Hope, positioned above it. This differs from the cross which is superimposed over the gravestones of Harriet and Eliza. Each of the three stones measures 64cms (25in) high by 70cms (28in) broad. The anchor or cross adds 28cms (11in). Harriet’s gravestone is made of red sandstone which seems to be softer than the grey sandstone of the other two, as the lettering is more significantly weathered. Harriet’s gravestone, however, though the oldest appears to be the least affected by blackening due possibly to pollution. The gravestones of Eliza and Harriet are damaged, possibly having been chipped when they were moved from their original sites. Eliza’s gravestone clearly comprises two separated pieces of stone, but those of Harriet and George appear to be sculpted from one stone. Only the gravestone of George uses Roman numerals. According to the 1861 census John Boyle aged 61, born in Hull, was living with his wife Elizabeth, aged 33, born in Market Drayton, Shropshire, and their son William aged 2, born in Devon. John had become the incumbent of Holy Trinity Church, Barnstaple, and they had two young women servants. It is not known what happened to Elizabeth’s son William, as he could not be located in the 1871 census. It is possible that Elizabeth may have married again after John Boyle died (by 1879), changed her family name and changed her son’s last name too. There is no suggestion that Elizabeth was buried at St Mark’s. Many thanks to Dr Rosalind K Marshall for her generous help with the research.